Stewarding companies through a fragile international system in transition is and will be challenging. The current international order is fragile because the global leadership vacuum is widening, diverging concepts of sovereignty are colliding, the fabric of political power is changing, and emerging status quo challengers are combining cooperation and competition to test the resolve of incumbent lead nations. The ambivalence of technological progress reinforces all of these aspects. Most importantly, corporate decision-makers and investors need to understand that Adam Smith's idea of an 'invisible hand' driving a laissez-faire approach to politics is over. This transition phase is characterized – proverbially – by the 'iron fist with deep pockets,' i.e., authoritarian capitalism, and the vociferous 'Twitter finger,' i.e., executive populism. Both question well-established modes of interaction between politics and economics. Today's international order has enabled and has been shaped by the free flow of goods, services, data, and capital and the unrestricted movement of people. These global exchanges have created strategic flows that have advanced prosperity and deepened connectedness. But the fraying international order gives rise to a more skeptical view on connectedness. Rather than emphasizing the benefits and opportunities, a prevailing zero-sum logic underlines and exploits the vulnerabilities of dependence. That is why nations, in particular, ambitious emerging status quo challengers, are focusing increasingly on what we call 'Flow Control' as a new expression of geo-economic ambitions. Flow Control is the will and the capability of an actor to define the framework and the operational conditions for strategic flows. This entails the power to (1) define, monitor, and enforce the rules that enable flows, (2) decide upon access to and maneuverability within the geospatial corridors that flows traverse, and (3) shape the volume and the direction of strategic flows by using flow enablers (e.g., infrastructure, transport means, technology) for one's own purpose and denying their use to competitors. 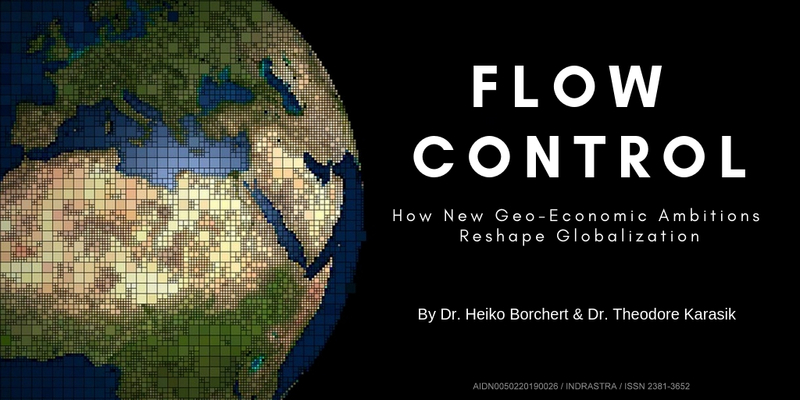 Flow Control entails a broad spectrum of instruments at the intersection of geostrategy and geo-economics. Flow Control is the testing ground on which a new grand systemic competition is emerging. This competition unfolds along four different but closely interrelated trajectories: First, the competition for zones of influence is about different geostrategic concepts of order. Global supply chains constitute the center of gravity, as they enable strategic flows. Second, the competition for norms, principles, and standards is about the 'rules of the road' of international politics and economic cooperation. Diverging concepts of sovereignty and different geo-economic ambitions will challenge unifying rule sets in favor of preferential rules relevant only among groups of like-minded actors. The competition for narratives constitutes the third element, which focuses on the dominant stories and the main arguments needed to influence global public opinion. Normative preferences related to good and bad behavior are increasingly relabeled as questions of national sovereignty and national security concerns. These concerns, in turn, are used to justify protectionist policies that serve to protect national industry champions and restrict market access for foreign competitors. Finally, the competition for alternative models of prosperity is about the fundamental ideas that govern the social contract, i.e., the relationship between citizens, the state, and the market. Most crucially, democracy is no longer seen as the only route to economic success. Authoritarian state capitalism is increasingly seen as a viable alternative – with wide-ranging consequences for the other three vectors of the four-fold grand systemic competition. Flow Control leads to an increasingly contested, polarized, and much more volatile business world. All elements of Michael Porter’s famous ‘Five Forces’ model of corporate competition come under pressure, which illustrates the scale of the challenge for business leaders. First of all, a competitive rivalry will increase due to the rise of state-owned enterprises that will be able and willing to take much more risk in return for politically motivated benefits. Emerging markets show a lower degree of penetration with traditional business models and concepts, thus giving challengers more leeway to experiment. This factor increases the number of new market entrants that benefit from digitization. Third, emerging powers want to diversify the national economies and set up indigenous champions. Thus, the threat of local substitutions for existing products and services is growing. Fourth, ambitious governments strengthen the bargaining power of local companies by handpicking future national champions, which become the required partners of choice for international business. Finally, different attributes such as the rise of identity politics and contentious debates over the role and relevance of data protection in the digital world will beef up the bargaining power of buyers. First, downstream competition is the 'default pattern' in most extractive industries, as suppliers try to leverage control over resources and the infrastructure used to reach consumer markets. For decades this pattern perfectly described Russia’s energy foreign policy. But as of recently, the United States seems to adopt a similar stance in connecting policy goals with oil exports. Second, upstream competition describes a situation where a company or a country leverages a dominant market position to 'reverse engineer' the supply chain at the cost of an incumbent downstream competitor. This dynamic was at play a while ago between China, a key iron ore importer and shipbuilding nation, and Vale, Brazil’s major iron ore exporter with a substantial share of the world’s seaborne iron ore trade capacity. China blocked Vale ships from its harbors because of safety concerns. In response, Vale stopped hiring Chinese vessels. Third, midstream competition emerges from the ambition of a company or a country to exploit its central location, connecting different sources of origin and destination. There is hardly a better example to illustrate the power of midstream competition than the air traffic policy of Qatar and the United Arab Emirates. Both nations set up world-leading airlines and modern air transport infrastructure and thus succeeded in shifting global transport flows away from European hubs. Finally, lateral competition offers the most interesting geostrategic and geo-economic options. Unlike the other three patterns, lateral supply chain competition benefits from the absence of infrastructure. In this case, there is no, or only weak, path dependency on established business models, which opens the door for new ways of thinking by moving across supply chains in different industry sectors. To improve logistics services in China, JD.com, one of the country’s leading retail stores, is developing a commercial drone that can carry up to one ton of cargo and planning to build over 180 drone airports in Southwest China. The aim of venturing into establishing an air transport network is to deliver agricultural products from the province of Sichuan to anywhere in China within 24 hours and to drastically cut costs. But it is not hard to imagine, that this approach could also offer obvious defense benefits. Ultimately, Flow Control in the context of the grand systemic competition is about to change the paradigm of international cooperation: Key instruments that were used up to now to bind nations together – such as rules, institutions, technical standards, and economic ties – are increasingly being turned into instruments working against each other. By taking recourse to preferential economic cooperation, like-minded challengers will try to strategically cocoon their partnerships, thereby lowering the level of outside interference. At the same time, they will try to lure developed and developing nations into their zones of influence. Unlike during the Cold War, this new grand systemic competition is economically and technologically unrestricted, because it taps into strategic technologies that are of commercial rather than defense origin. The logic of Flow Control produces a zero-sum outcome: One nation's access to a technology effectively locks out another nation. This has the potential to produce a bifurcated techno-economic ecosystem in which trade among preferred partners could prevail over global interaction. Given this new approach to understanding the geospatial context of international flows of ideas, materials, money, and the movement of people, investors will need to think carefully about the impact of these trends on the corporate world. Three issues, in particular, should receive more attention. First, investors will want to have more information on the geostrategic risk appetite and risk reporting of the companies in which they invest. Above all, they will require a more systematic view on the impact of geostrategic and geo-economic developments on corporate strategies, business models, and implementation plans. Second, corporations' vulnerability to sanctions is increasing significantly. International sanctions are becoming more personal. Emerging powers might want to emulate the Western practice of targeting high-value individuals in order to inflict pain on Western companies and countries. Former senior government officials that have been appointed to board levels are the most vulnerable exactly because they have been part of political systems that these emerging powers want to challenge. Investors will want to understand how companies are going to deal with this executive-level sanctions vulnerability. A similar risk emerges with technologies. Importantly, Flow Control posits that all technologies that are deemed relevant to establish and maintain strategic advantages could become sanctions targets. This requires corporate technology roadmaps that provide information on how to mitigate the technology sanctions risk. Finally, a more assertive interpretation of trade as a national security concern creates investor risks. The motives and the origin of investors will come under increased scrutiny. Investors thus need to reflect upon the likely economic and national security impact of partnering with co-investors from emerging status quo challengers. For one, some investment partners might no longer be en vogue. For another, creating strategic investment vehicles that provide governments with an option to keep national critical technologies under control could become an option worth considering. This is an abridged version of 'Flow Control Rewrites Globalization. Implications for Business and Investors', available from HEDGE21. Dr. Heiko Borchert (@HeikoBorchert) runs Borchert Consulting & Research AG, a strategic affair consulting boutique, and is responsible for strategic assessments at HEDGE21, a financial advisory service provided by ALCAZAR Capital Ltd., which is regulated by the Dubai Financial Services Authority. Dr. Theodore Karasik (@TKarasik) is a Non-Resident Senior Fellow at the Lexington Institute and a national security expert, specializing in Europe, Eurasia and the Middle East. He worked for the RAND Corporation and publishes widely in the U.S. and international media.